Our local “good news” paper turning forty this year is an important milestone. That's forty years of volunteerism, forty years of columns, forty years of photos, and forty years of reflections about Farmington in the Puddledock Press. In a time when there are no longer many independent local sources of local news, except people on social media, a local journal, newspaper, or even a newsletter for a town, that are not tied to corporate entities, are increasingly very rare; that's something to be very proud of. I'm not going to debate the merits of local, independent journalism here, though I do think that is a conversation we should be having. Rather, I want to you understand why such media is important from a historical perspective and how, given the map history has given us, the thought of permanence is an often an illusion. Change is the only permanent feature of the world. In archiving and museum work it is often said time forgets everything and everyone that does not seek to be erased. The more duplication, the further something goes from were it is born, the greater the chance of being found and used as part of the historical record. 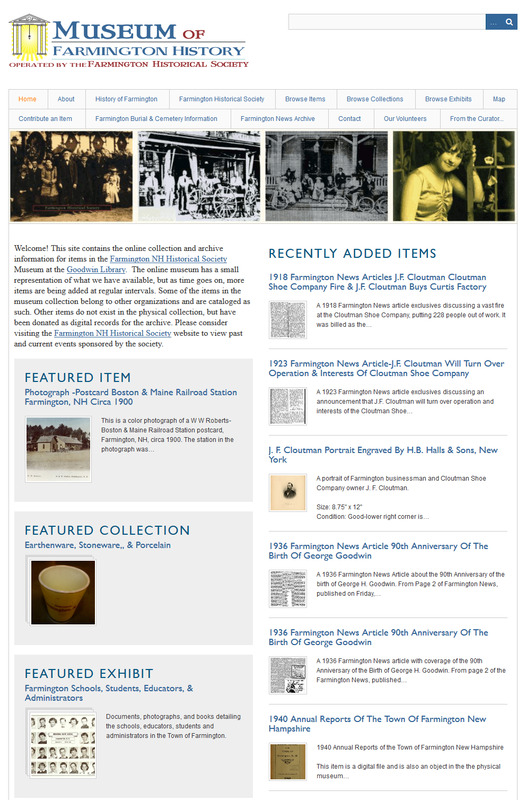 Every day I'm in the museum I have deal with reconstructing our town history from fragmented, often incomplete, or worse, missing resources. The sands of time and waters of the sea of forever are unforgiving and wear down the most tenacious egos and even the largest of stone monuments. The gathering of local history and the remembrance of those before us in the town are subject to the same fates. Most things that are made, most ideas people have, and most of the stories of those who have lived before us perish. What makes its way past the sands and waters are small tokens of who and what came before, often surviving with little context or relation. We've already lost the entirety of our historical record once, when the old library burned in the 1928 fire at the Farmington Opera House. I'm not eager to let that happen again. I'd like to think that many things can survive on social media and some will, but I'm not content to rely solely on them, as they are so young, in historical terms, they have just been born. Information from those services is often not backed up and is not easily gained if not directly saved. Imagine where those platforms and information they hold will be in fifty years, one hundred years, two hundred fifty years. Think about how most things you think of as permanent have changed just in the last few decades. Perhaps now you can understand my vigilance and wishes to diversify. 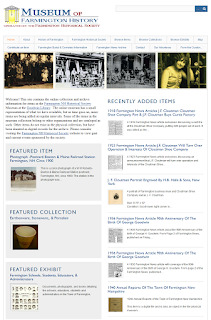 With the digital versions of the Farmington News, the Goodwin Library and Historical Society provide, and with the online Museum of Farmington History, hosted by the Historical Society, I'm trying to give us better odds of our town history surviving, by being in many locations and formats, at once. 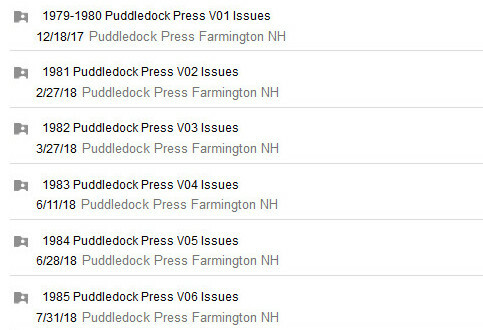 I view the The Puddledock Press information no differently. 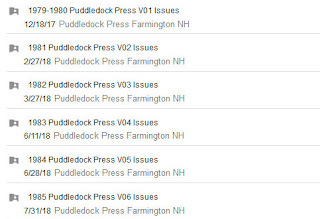 The Puddledock Press editions contain a wealth of local political, familial, and cultural, information, that thankfully started shortly after the printed regional newspaper Farmington News closed after providing those things for Farmington and the surrounding localities for a century. 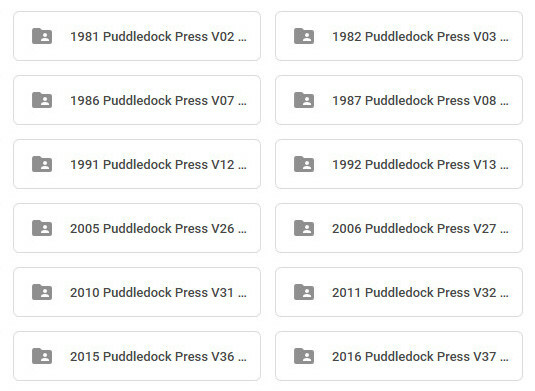 Both the Historical Society and the Puddledock Press now have past, digital archived versions of the Puddledock Press editions. 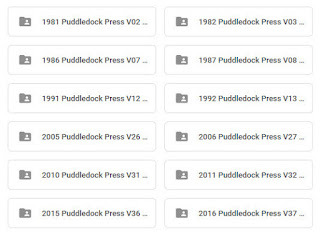 Currently, the Puddledock Press has scanned in and archived 1979- 1994 and 2004-2019. They are continuing to add more editions between 1994 and 2004 as they have time to scan them in. It can be a very time consuming process. Some of the older editions were quite large. Please be patient for the remaining editions. I'm very happy that we have this resource and I hope you see the value as well.